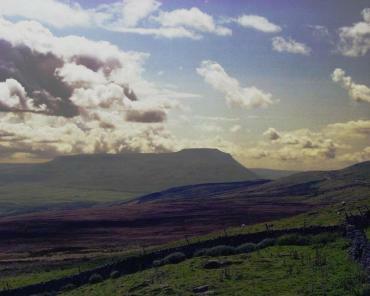 BeenThere-DoneThat: The area around Ingleborough, Yorkshire Dales, North Yorkshire. Ingleborough (2374 feet), the obvious hill in the distance (about eight miles away), viewed from the Pennine Way near Cam Houses which is about 7 miles from Hawes. We stayed near Hawes on this trip in 1998 at The Stone House Hotel which is on the Northern side of Wensleydale opposite Hawes. It is about a one mile walk from the hotel to Hawes. 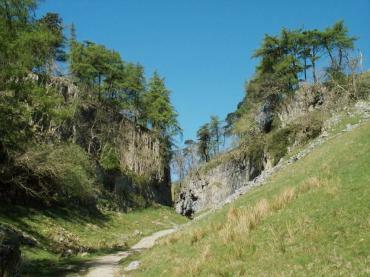 The Yorkshire Dales area is Carboniferous Limestone country with limestone pavements and many caves some of which are show caves open to the public. Looking up Trow Gill on one of the paths up Ingleborough. This path starts in Clapham village and, after just over a mile, passes by the entrance to Ingleborough Cave which is a show cave open to the public. 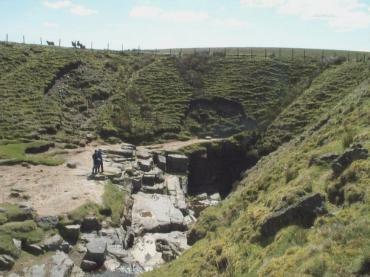 A little over another mile from Ingleborough Cave, after passing through Trow Gill, you will reach Gaping Gill (See below). This walk is relatively easy. Fell Beck (the stream) can be seen bottom left just before the stream bed ends abruptly and the water plunges 365 feet down Gaping Gill - the obvious black hole near the centre of the picture. This water emerges once again further down in Ingleborough Cave. On some weekends in May, June & August a winch is set up over the pot and members of the public may elect to take the ride down into the large cavern beneath and, I suppose if they are particularly lucky, back up again. 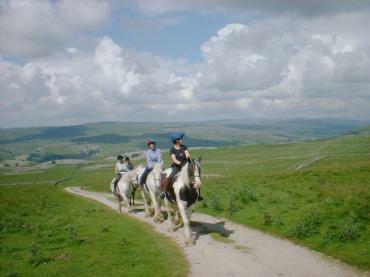 Horse riding on the high ground above Wharfedale. Wharfdale is about 7 miles further east from Malham. There are horse riding holidays available here for both adults and children together with hacks for the experienced rider.